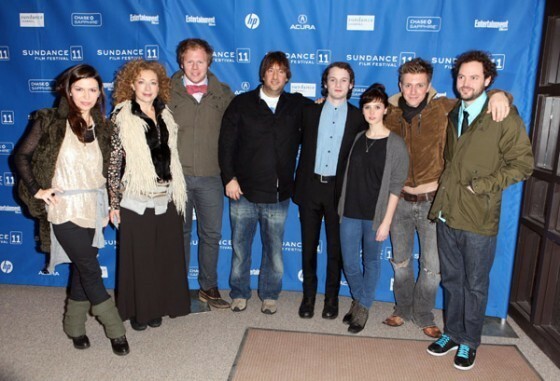 Charlie Bewley & Elizabeth Reaser Attend Sundance Film Festival! Charlie Bewley Preparing for a Marathon! Twilight actor Charlie Bewley has traded in his fangs for running shoes. The English actor, who plays the Volturi vampire Demetri in the Twilight Saga movies is in town busy training for the May 1 BMO Vancouver Marathon. Bewley is running and raising money as a tribute to his late friend and colleague stunt woman Jocelyn Clarke, who passed away from lung cancer on February 14 at the age of 36. While running a full marathon is certainly impressive Bewley is picking up the pace, if you will, and actually adding another 21 km to the 43 km marathon length, bringing his day’s run total to 64 km. “For me it’s an underlying message for anyone who feels they are stronger than what they are putting out right now,” said Bewley, who lives in Los Angeles but has called Vancouver and Whistler home in the past. Bewley, who met Clarke on a bus on the way to audition, is further honouring the memory of the Vancouver stunt woman, who doubled for Dakota Fanning’s vampire character in Twilight’s New Moon and Eclipse movies, by donating funds raised through a ticket draw (charliebewley.com/runforyourlife) to the Lions Gate Hospital Foundation. Each dollar sponsored earns one ticket into a draw to win an advanced, private screening for the winner and 20 of their friends for Twilight Saga: Breaking Dawn Part 1, which is currently shooting in Vancouver. And attention Twihards, Bewley will make an appearance at that screening. “If I can do this and make enough buzz about it I feel I can inspire people not only to explore their own limits but to get out there and help causes,” said Bewley, who drove cab in Whistler for two years. On race day Bewley plans a 4:30 am. start and figures he’ll need about six hours to complete the 64 km. In theory the English actor will get a few minutes to catch his breath when he stops after the first 21.1 km to make the draw for the screening package donated by Twilight studio Summit Entertainment. As for Twihard fans, when it came to Twilight gossip the English actor’s lips were sealed tighter than a vampire’s crypt.